One Eye Open received 3rd place in the 2010 Interactive Fiction Competition, plus 3rd place in the author-judged Miss Congeniality awards for that year. It was also a 2010 XYZZY Award finalist for Best Game, Best Story, Best Setting, Best Puzzles, and Best Individual Puzzle. This is a horror game that contains textual descriptions of graphic violence, as well as adult language and other themes which may not be suitable for younger players. 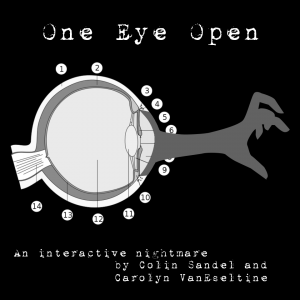 Due to its size, One Eye Open runs too slowly for in-browser play.